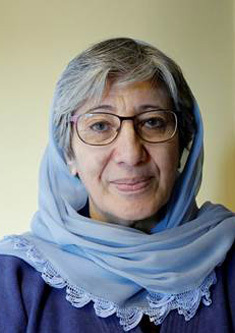 Chairperson of the Afghan Independent Human Rights Commission (AIHRC), Ms. Samar was, from 2005 to 2009, the United Nations Special Rapporteur on the situation of human rights in Sudan. She has overseen the expansion of human rights education, the implementation of a women's rights program, and the monitoring and investigation of human rights abuses across Afghanistan. Ms. Samar was the Vice Chair of the Emergency Loya Jirga, a role that brought her political and negotiating skills to the fore, and the first Deputy Chair and Minister of Women's Affairs in the Interim Administration of Afghanistan. She founded the Shuhada Organization, which operates 55 schools in Afghanistan as well as three schools for Afghan refugees in Quetta, Pakistan.